Ḥad Gadya has a place in Seder tables throughout the Jewish world, and in many communities it was read in translation. This translation is in Judeo-Tamaziɣt (also known as Judeo-Berber), based on the translation of Yehuda Derʕi, born in Ighil n-Ughu in south-central Morocco in the 1920s. Here it is typed out in vocalized Hebrew, along with transcriptions in Tamaziɣt-Latin and Tifinagh. 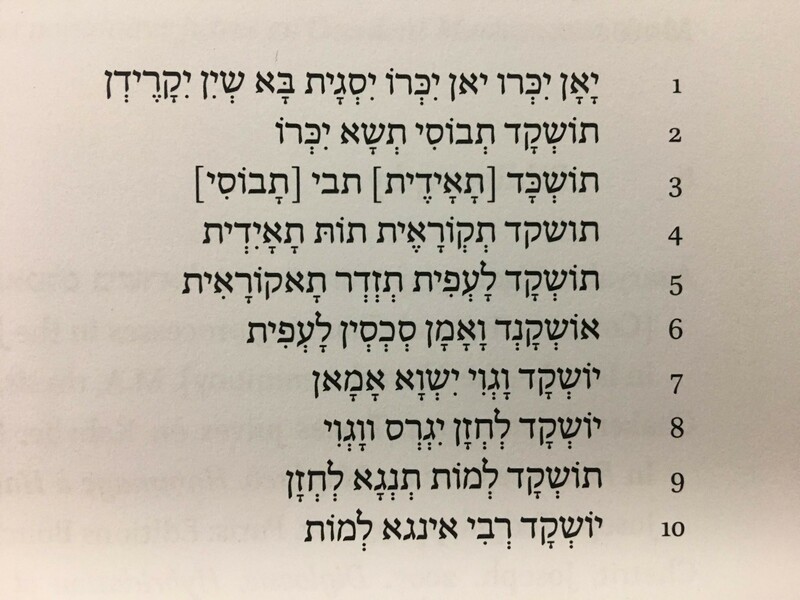 Interestingly, instead of “slaughterer,” Yehuda Derʕi’s translation reads “lḥǝzzan,” which is used in place of “rabbi” – because to the Tamaziɣt the term “ṛǝḅḅi” is reserved for God alone. This text could be read alongside the traditional text of Ḥad Gadya during a Passover seder. A dot below, as in ḅ, ṛ, or ẓ, means the letter is velarized a la Mizraḥi ח, ט, or צ. The Tamaziɣt languages allow almost every sound to be velarized, unlike Semitic languages which limit velarization to several letters. The closest English parallel would be to read those letters in a very creaky voice. ɣ is a sort of rolled g, very close to the modern Israeli Hebrew back pronunciation of ר.
ă is a rounded /ɔ/, as in “dog” in a New York accent. ʕ is a pharyngeal sound like a Mizraḥi ע. Doubled letters are geminated (aka lengthened). חַד גַּדְיָא, דְּזַבִּן אַבָּא בִּתְרֵי זוּזֵי, חַד גַּדְיָא, חַד גַּדְיָא. Yan ikru yan ikru, isɣayt ḅḅă ssin iqaridǝn, yan ikru yan ikru. Tuškad tbusi tǝssa ikru, isɣayt ḅḅă ssin iqaridǝn, yan ikru yan ikru. Tuškad taidit tǝbbi tabusi tǝssa ikru, isɣayt ḅḅă ssin iqaridǝn, yan ikru yan ikru. Tuškad tquṛăidit tut taidit tǝbbi tabusi tǝssa ikru, isɣayt ḅḅă ssin iqaridǝn, yan ikru yan ikru. Tuškad laʕfit tǝẓdǝr tquṛăidit tut taidit tǝbbi tabusi tǝssa ikru, isɣayt ḅḅă ssin iqaridǝn, yan ikru yan ikru. Uškand waman sǝxsit laʕfit tǝẓdǝr tquṛăidit tut taidit tǝbbi tabusi tǝssa ikru, isɣayt ḅḅă ssin iqaridǝn, yan ikru yan ikru. Yuškad wăɣwi iswa aman sǝxsit laʕfit tǝẓdǝr tquṛăidit tut taidit tǝbbi tabusi tǝssa ikru, isɣayt ḅḅă ssin iqaridǝn, yan ikru yan ikru. Yuškad lḥǝzzan iɣǝrs wăɣwi iswa aman sǝxsit laʕfit tǝẓdǝr tquṛăidit tut taidit tǝbbi tabusi tǝssa ikru, isɣayt ḅḅă ssin iqaridǝn, yan ikru yan ikru. Tuškad lmut tǝnɣa lḥǝzzan iɣǝrs wăɣwi iswa aman sǝxsit laʕfit tǝẓdǝr tquṛăidit tut taidit tǝbbi tabusi tǝssa ikru, isɣayt ḅḅă ssin iqaridǝn, yan ikru yan ikru. Yuškad ṛǝḅḅi inɣa lmut tǝnɣa lḥǝzzan iɣǝrs wăɣwi iswa aman sǝxsit laʕfit tǝẓdǝr tquṛăidit tut taidit tǝbbi tabusi tǝssa ikru, isɣayt ḅḅă ssin iqaridǝn, yan ikru yan ikru. 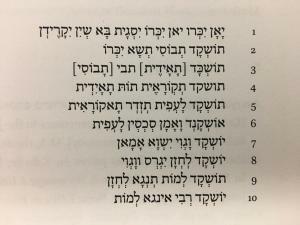 “יַאן יִכְּרוּ | Yan ikru :: a Judeo-Berber Translation of Ḥad Gadya, by Isaac Gantwerk Mayer” is shared by Isaac Gantwerk Mayer with a Creative Commons Attribution-ShareAlike 4.0 International copyleft license.